If you like Depeche Mode, you'll love De/Vision- Germany's No.1 Synth-pop/Electro-pop band that not only play like Depeche Mode but also actually sound like them. 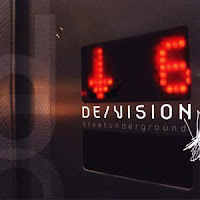 Originally formed in 1998, De/Vision have been busy playing their predominantly electronic synthpop music with melodic English vocals until the phenomenal chart success of their third CD "Fairyland" marked the breakthrough in the global arena. Their output is nothing short of impressive, they have released over 10 albums besides various singles, remixes and compilations. Along with Seabound, a similar and equally popular German Synth Pop band, they are now quite well known the world over for their trademark mix of electro-dance rock and distinctive tech-tinged English vocals which has also refined over the years. Though "Noob" is their latest release, I am highlighting 2 trend setter albums - "6 Feet Underground" released in 2004 and "Subkutan" released in 2006 for your listening pleasure. Download and get immersed in aural bliss. Cmon Rashmi, you shouldn't. Experiment a bit. Download, listen to De/Vision and enjoy the good stuff.